Heat oil in heavy large saucepan over medium–high heat. Add onions, celery, carrots, and garlic; sauté until vegetables begin to brown, about 15 minutes. Add 4 cups broth, lentils, and tomatoes with juice and bring to a boil. Reduce heat to medium–low, cover, and simmer until lentils are tender, about 35 minutes. Transfer 2 cups soup (mostly solids) to blender and puree until smooth. Return puree to soup in pan; thin soup with more broth by 1/4 cupfuls, if too thick. Season with salt, pepper, and a splash of vinegar, if desired. Ladle soup into bowls. Garnish with celery leaves. 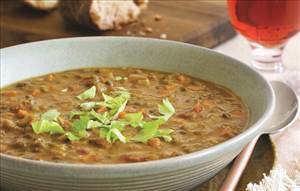 There are 250 calories in 1 serving of French Lentil Soup. Calorie Breakdown: 22% fat, 53% carbs, 25% prot.